The Friends of Pisgah met at the Horseshoe Road Trailhead in Chesterfield Saturday, May 13th, 2017 at 10:00 am to work on the upcoming 10K race loop (mostly Reservoir, North Ponds and Lily Pond Trails). Numerous trees and branches across the trails were removed and paths opened for water to drain off the trails. We broke up into 3 groups. Doug Favreau, Iva Woods and Sherisa Sterling cleared the northern section of South Woods Trail, the Habitat Trail and Lily Pond Trail. Jon Knickerbocker, John Herrick and Park Manager Whip Newell cut tree on the south end of Lily Pond Trail. 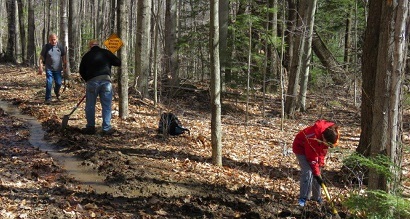 Matt Edson, Jack Kondos and John Hudachek cleaned the Reservoir Trail down to North Ponds Trail. The intersection of North Ponds Trail and the Reservoir Trail was cleared and new signs made by Whip installed. Much pooled water was drained. The black flies were fierce at the trailhead, but diminished in the park interior. We were all done and on our way home by 2:30.
to be out enjoying the park. We are happy to tell you that results are posted and can be found at http://results.active.com/events/3rd-annual-friends-of-pisgah-5k-10k-trail-race-walk. In the coming days be sure to check out the Friends of Pisgah Facebook page www.facebook.com/FriendsOfPisgah/?ref=bookmarks.for race pictures. We hope to see you again next year and be sure to invite your friends for even more fun. for water to drain off the trails. Prepare for black flies and bring water and lunch. Bring your own tools or use ours. 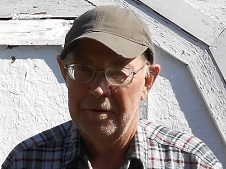 Clifford W Struthers, Jr., who died on March 21, 2017, was a long time active member of the Friends of Pisgah including serving on the Council. Cliff assisted Park Manager, Norma Reppucci, in maintaining the park using his tractor to grade roads. He also surveyed and mapped the historical sites in the park. He will be missed. See the attached obituary for details. Whip Newell, the Pisgah Park Manager, informed us this morning that all Pisgah trailhead parking lots were plowed Thursday, March 16th. Mark your calendar, Saturday, May 27th. That's the day the Friends of Pisgah will hold the third annual Run In The Park 5k/10k trail race/walk. Be there and give those feet of yours a good workout. Registration will begin at the Horseshoe trailhead parking lot in Chesterfield at 8:30 a.m. The races will begin at 10 a.m. Help support the Friends of Pisgah's all-volunteer effort to build and maintain bridges, upgrade more than 50 miles of trails, improve access roads, and create new signage and blazing in the park. The registration fee is $25 per adult, $10 for youth 16 years and under. All proceeds go "on the ground" to make Pisgah State Park the best that it can be. So, get off the couch and mark that calendar. The poster and race form are attached below. 10:00 am, at the Horseshoe trailhead. Hope to see you then. For our January trail maintenance we will meet at the Horseshoe trailhead in Chesterfield at 10:00 am to put up as many new signs on the North Ponds, Chestnut Hill and Parker trails that we have time for. Bring water, lunch and hammer to nail in new signs or use ours. Also a small crow bar might help to remove the old wood signs. We also have to carry out the old wood signs, so backpacks or similar would be useful. We will help transport people to these interior trails if the conditions are good. https://www.nhstateparks.org/news-and-events/projects/pisgah-timber-harvest.aspx to see the project from start to finish. The Keene Connector Trail from Old Swanzey Road in Chesterfield to the west end of the Horatio Colony Preserve in Swanzey is closed due to a logging operation. It will be re-opened by the summer of 2017. Signs have been placed to this effect at the Colony Preserve in Keene, at the lower end of Old Swanzey Road, at Beals, at Kilburn, at Plain Road, and at Madame Sherri's. This sign is at Old Swanzey Road.